Hi Friends: There is a new challenge today over at the Crafting When We Can Challenges Blog, where the current theme is to Use Die Cuts. Please visit our fabulous sponsor this week, Melonheadz, to see all of their wonderful products! My creation for this week is an art journal page using the digital images from the O is for Owls Combo Pack. I used Spellbinders nesting circle dies for my die-cut circles that are in the background of my journal page. Please see below for pictures, process, and supply list. 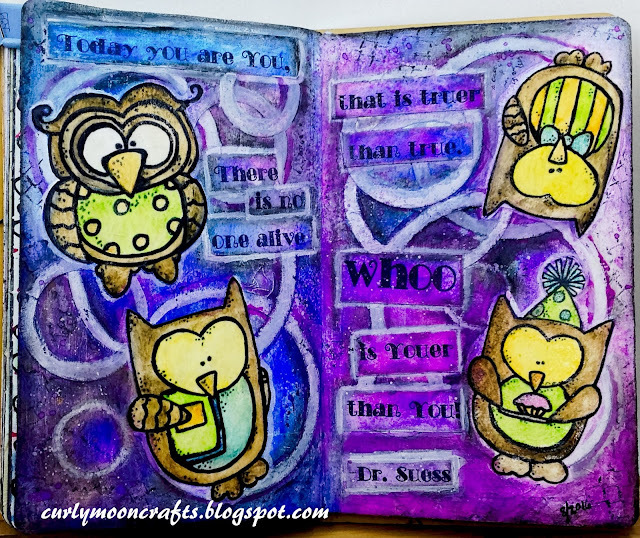 When I first saw this owl set, I just knew they'd make a great art journal page using this great quote from Dr. Suess. I am sad that my photo doesn't capture the full color, sparkle and shine in the original. I printed the images onto white cardstock, covered them with some clear gesso, fussy cut them, then colored them with Distress Crayons. I added some sparkle to their beaks, clothes, and accessories using a Stardust glitter pen. For the journal background, I first added some random washi tape for texture. I cut the circles from scrap cardstock, and layered them on the page in random, overlapping order. I printed the quote onto white cardstock, cut it into strips, and glued them to the page. Then I started coloring the background with bright purple, blue, and pink Gelatos. I used some Black Soot Distress Crayon to outline the circles and words. Then I used some Lindy's Stamp Gang sprays to add a bit more color and shine. I used gel medium to add the owls, then I almost decided to completely scrap the page because I really wasn't happy with it. But, I decided to continue to work on it by using some white gesso to highlight/color the circles, word strips, and the owls. Once that was done, I really liked the page. So I used some Prima mini stamps with Archival Jet Black to add some interest, then added some splatters with gesso, Black Soot Distress Crayon, and some of the LSG sprays. I wanted to make the owls shinier, so I added some Glaze medium to them. Then I finished the page with more Black Soot crayon smudged around the edges.